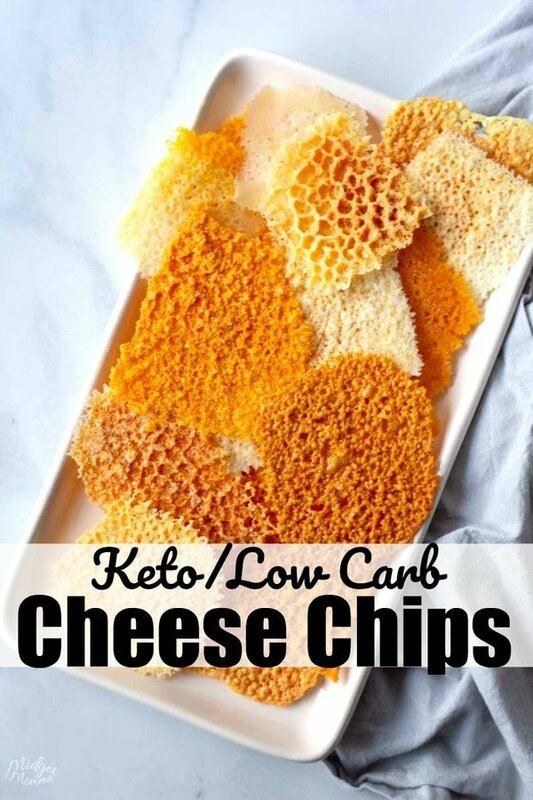 If you are looking for a simple keto Cheese chips recipe, that is quick and easy you are going to love Keto Cheese Chips Made in the Microwave. Making keto cheese chips in the microwave takes just a few minutes and they are perfect for dipping or snacking! This Keto Cheese Chips recipe makes tasty keto cheese chips using the microwave. 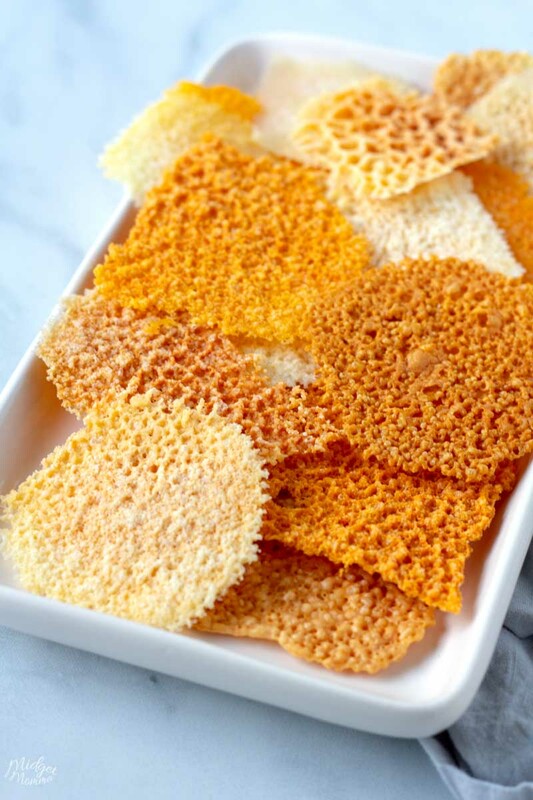 If you are looking to make them in the oven, check out this oven baked cheese crisps recipe or you can use the keto cheese taco shell recipe and not bend them. If you are looking for a snack with a kick, you have to try the Jalapeno Cheese Crisps! They are sooo good! I love making Keto cheese chips both ways, they come out tasting amazing no matter which way you make them but depending on the amount of time I have or how hungry I am, waiting for the oven to heat up is not always an option. 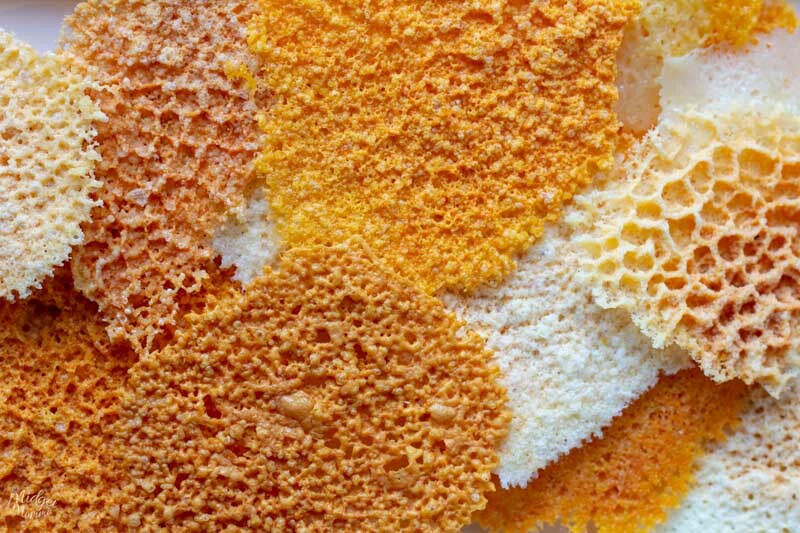 You can make cheese chips using block cheese, pre-sliced cheese or shredded cheese. If you are running short on time, grab the pre sliced cheese from the store. If you are using shredded cheese, just put the cheese into piles. If you are slicing block cheese into slices then you are going to want them on the thinner side. 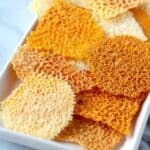 I find the natural cheese slices work best when making keto cheese chips, but if you have other cheese on hand you will still get tasty cheese chips! Yellow or White Cheddar Cheese – Normally I love white cheddar cheese but man the classic yellow cheddar cheese really taste like chez-its! 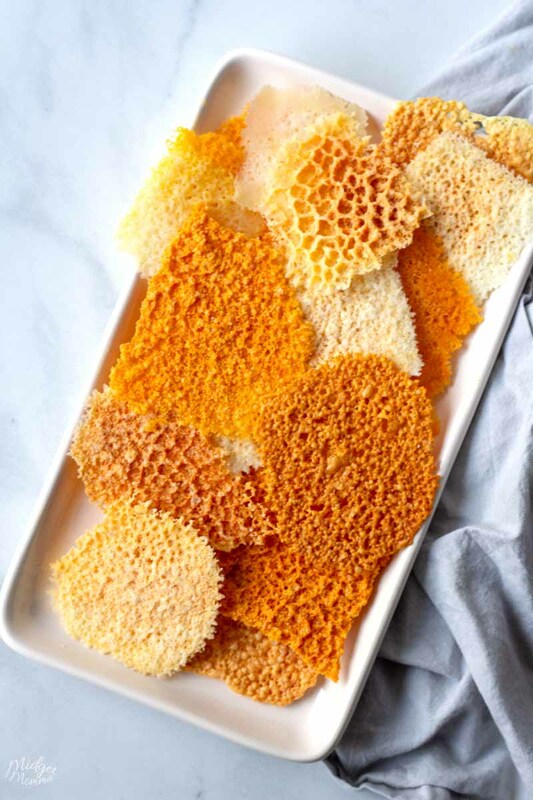 I am also going to tell you do NOT skip using parchment paper, if you do you are going to end up with a big cheesy mess and no one has time for cleaning that up! If you are looking to make things a little easier, you can also use a silicone mat and then just wash it when you are done. 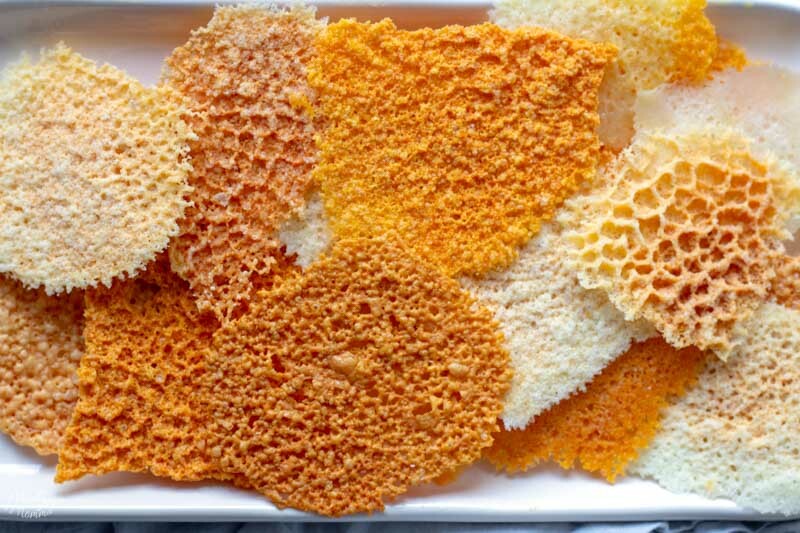 There are times when I make a batch of these cheese chips ahead of time, so I can have them for when I am on the go. I store my keto cheese chips in the fridge in a plastic bag or a plastic container, like my favorite rubbermaid set. My favorite way to enjoy keto cheese chips is by themselves like you would any other type of chip. They are soooo good! However they are also perfect for other things as well. Keto Cheese Chips are also an awesome option instead of croutons when having a salad, for those who like to have a crunch. They are also good to use as a dipper with things like Chunky Avocado Dip. You can top them with your favorite lunch meat, veggies, keto chicken salad and more. 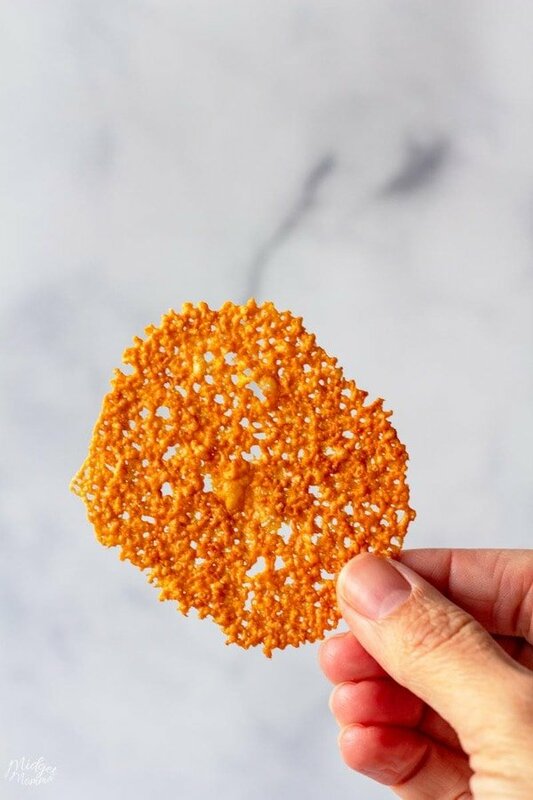 These Keto Cheese Chips made in the Microwave are a tasty and quick Keto snack. They are also perfect for adding on top of salads! Line a microwave safe plate with a piece of parchment paper. If you are using full size pieces of cheese cut your cheese slice into fourths. If you are using a block of cheese you need to slice your cheese here and if you are using pre sliced cheese you can skip this step. Arrange the cheese on the plate making sure to leave room between the slices so they don't run together. Remove the parchment paper from the plate and allow the cheese to cool. If any of the chips melted together you can carefully break them apart or just enjoy a large chip. Nutrition information is based off of 3 ounces of Sharp Cheddar Cheese, however most cheese has 0 carbs, so no matter what cheese you are using you will still have a 0 carb cheese chip. Check out these Keto informational posts! Tasty Keto Recipes you will love! 20 Keto Casserole Recipes – Casseroles make dinner time easy! These Keto Casserole Recipes are ones my whole family loves! Keto Seafood Recipes – 20 Keto seafood recipes that are totally amazing! All of these seafood recipes are easy to make and taste great! Keto Chicken Recipes – Over 30 Keto Chicken Recipes that are easy to make! You will never be bored making keto chicken recipes with this list! Keto Chicken Bacon Ranch Recipes – If you love the chicken bacon ranch flavor combo then you will love this awesome keto recipe list! Keto Spaghetti Squash Recipes – Spaghetti squash is such a tasty veggie, add in the different ways of cooking and making spaghetti squash with these recipes and your whole family will love spaghetti squash! Keto Breakfast Recipes– Stuck on what to eat for breakfast? There are a lot of tasty Keto breakfast recipes (not just eggs) that are super tasty! Keto Instant Pot Recipes – Tasty Recipes that you can cook quickly in your instant pot! Keto Soup Recipes – Soup is great for lunch or dinner, Plus it is perfect on chilly days too! I’m glad you enjoyed these what kind of cheese did you choose to make them with?